Well, that’s exactly what you can expect from telescopic ladders! Thanks to an innovative design, telescopic ladders provide a host of advantages over standard ladders, as well as being able get you closer to those hard to reach areas. The Finether 5M Aluminum is a robust, versatile telescopic ladder that is suitable for use at home and work. EN131 certification means it is safe to use for light industrial applications, and its massive 5m height will also be useful in this regard. This means you can easily use at work or around the home, with the impressive height suitable for washing windows, cleaning the gutter, and building maintenance. The step ladder feature is very useful for home decorating too! 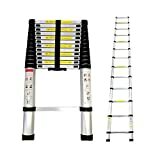 This is great option for anyone looking for a telescopic ladder that will be performing a range of tasks. It offers a fantastic maximum height, made even better by the foot-by-foot extension achieved with each rung. Whether you will be using it at home, work, or both, this is a ladder worth investing in. However, with EN-131 certification, you can easily use the VonHaus for various professional applications, although the 2.6m height may somewhat limit this. So, while it may not be best suited for working with due to the somewhat lower height capacity, there are few jobs around the house that this ladder won’t be able to help you with, and it can certainly be thought of as one of the best smaller telescopic ladders available today. Of course, it can easily be used commercially too, with EN-131 certification ensuring it is built to the highest safety standards possible. It’s also great for work because it is easily collapsible, with a retracted height of just 0.86m! 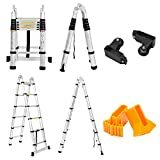 These great features make the Finether DIY 3.8M telescopic ladder perfect for many people. 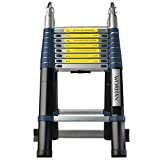 It works in both commercial and domestic capacities, so anyone looking for a ladder that can be used in either will certainly like what they see here. 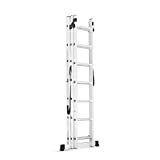 It’s a highly versatile ladder, made even better by its compact design and how easy it is to store and transport, which will especially appeal to trade workers. The massive 5.6m extended height certainly makes the model ideal for many different trade sectors, and the EN-132 certification ensures that it will be safe and suitable for every work environment. It also features sturdy rubber pads at the feet to ensure maximum stability, as does the stabiliser bar fitted to the base. Still, expect this to remain strong and reliable throughout its lifespan, as it enjoys a total weight capacity of 150kg. That’s not to say you cannot get use out of it at home, as the ladder is capable of reach both high and low heights as need. If you are looking for a ladder to get you to those harder to reach places such as the roof or higher windows, it’s worth investing in for sure. They even come with a handy carry bag for storing and transporting! A great model for home use, this ladder will be suited for almost any home project or task you may need them for, but they can easily serve as a reliable set of ladders for work too. Another fine selling-point is the material used for the ladder. It’s a combination of high-quality aluminium and PVC (found on the sides) which helps the ladder be more durable over the long-term. Don’t expect any breakages or wear and tear found on other ladders! The Stella DIY 2.6M is a robust telescopic ladder that will not disappoint. It’s been perfectly built for use in and around the home, so while it may not be the best option for commercial use, you can be sure it will get the job done at home. The Charles Bentley DIY 2.6m is a high-quality telescopic ladder that is perfect for home use. However, with EN131 certification, you can certainly use it for any light trade work, making it very versatile indeed. Telescopic ladders are extendable ladders that can be easily collapsed for storage and transport purposes. There are various telescopic ladder designs available, all of which are based around classic ladders, including straight and folding. The main difference is that telescopic ladders are made using lightweight materials and have a design feature that allows them to expand and retract in specific increments. As they can be collapsed into much smaller sizes yet can expand to reach certain heights, telescopic ladders are much easier to store than traditional ladders, as well as being much easier to transport – they can fit into the boot of even the smallest cars! Telescopic ladders offer a range of benefits when compared to more traditional types of ladders. They are perhaps the most versatile style of ladder currently available, having many useful applications in both personal and professional capacities. Easy to Store and Transport – One of the most prominent reasons to get a telescopic ladder is because it is easy to store and transport. Their ability to be easily compacted into a much smaller ladder makes it easy to transport in virtually any vehicle, while they can be stored anywhere at home without taking up space. Lightweight Materials – To make them easier to move and store, telescopic ladders are made of lightweight materials, typically a combination of aluminium, fibreglass, and plastic. This results in ladder that isnt the heaviest, making it much easier to use for many. Useful Extension – The way in which telescopic ladders works means that they collapse and extend one rung at a time. This provides a lot of height options when extending the ladder, allowing it to be used at many different heights as needed. Ideal for Home or Work– All telescopic ladders with an EN-131 classification can be used around the home or in the workplace. This helps to make them some of the most versatile ladders on the market. Robust Design – Despite the ability to become small and compact, telescopic ladders remain very strong. They can withstand significant loads when in use, with the ability to handles weights of up to 150kg, depending on the specific design of each model. Given the wide range of benefits offered by telescopic ladders, they have grown in popularity in recent years, meaning there are many options available when looking to buy. Unfortunately, this has resulted in many cheaper telescopic ladders being sold that don’t meet the same standards as the more reputable makes. They may lack certain features and functions, or could be even be more dangerous to use, which is obviously something everyone wants to avoid. Of course, just it’s an affordable telescopic ladder, doesn’t mean it’s not reliable, some may just with a basic design and fewer functions but can still work well for specific tasks. Class EN131 are widely viewed as the most suitable option, as they are among the safest to use and are still versatile to be used in domestic and professional applications, while maintaining an affordable price. When looking to buy a telescopic ladder, be sure it has the step by step feature. This refers to the way in which the ladders are extended, which is done step by step, allowing for many different heights to be achieved when in use. This is the most desirable feature you will want from a telescopic ladder, as it can be used in a variety of tight spaces where normal ladders aren’t able to fit. It also means that the ladder will lock at each individual rung, which is the safest design possible. Be aware of this, as some of the cheaper models are not able to lock unless the ladder is fully extended, taking away a key advantage of being able to use the ladder at several height settings. There’s some safety features on telescopic ladders that you will not want to skimp on! For instance, it’s worth splashing the extra funds for features such as an aluminium stabiliser that offers additional support or rubber coated feet for better grip when in use. Stabilisers should certainly be present on larger ladders, as they require the extra support to ensure they are as safe as possible. Cheaper models tend to skip this help lower the price, but it is recommended that you invest a little more – it is your safety after all!